AWeber vs MailChimp: Which Email Marketing Service is the Best? Nimbus Themes / Magazine / Reviews / AWeber vs MailChimp: Which Email Marketing Service Is Truly the Best? What Do I Need to Know About AWeber and MailChimp? 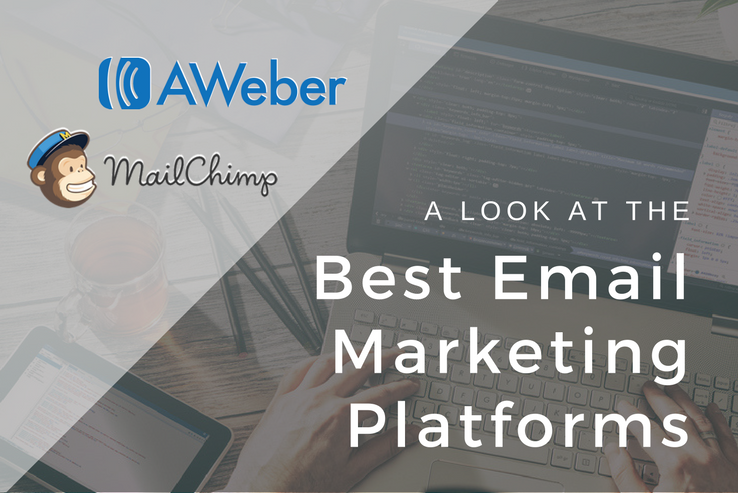 AWeber and MailChimp are two of the most popular email marketing and automation providers out there. Let’s quickly cover what you need to know about both email service providers and define an evaluation criteria before we put them through their paces to see how they stack up. AWeber was started by Tom Kulzer in 1998 as a platform that runs an opt-in email marketing service. As of this writing, the company has over 100,000 small businesses, bloggers, and entrepreneurs using its services across the globe. AWeber is a premium email marketing service that enables online business owners to create campaigns, set up autoresponders for drip emails, write email newsletters, and much more. In addition to its wide range of features, the company also focuses on delivering a remarkable user experience for its customers. The company started as a side project funded by various web-development jobs. Now we’re the world’s leading email marketing platform, and we send more than a billion emails a day. Used by over 14 million people around the world, MailChimp is a comprehensive email marketing service that comes with lots of functionality under the hood, allowing you to do everything from automating marketing emails to analyzing detailed reports to grow your business. When it comes down to AWeber vs MailChimp, both email marketing services have their own list of pros and cons. We aim to compare and contrast AWeber vs MailChimp to help you determine which one is right for you. And once we’re done exploring both of them, we’ll wrap up with a summary of our findings. Price. Often times the price of a service is the driving force behind a user’s final decision. Ease of Use. This lets you know how intuitive the platform is to use and the level of technical expertise you’d need to get started with email marketing. Functionality. A good email marketing service has all the right tools in place to help you meet your goals. Customer Support. A good email marketing service has a helpful customer support staff available around the clock. Although there are a number of criteria upon which you can evaluate AWeber vs MailChimp, we see the above considerations as the most important one to focus on. With that out of the way, let’s explore the two email marketing service providers in more detail. How Do I Choose Between AWeber vs MailChimp? Choosing an email marketing service for your online business can be a truly daunting task – especially since you’ll be using it for at least a few years. There are several factors that you need to take into account before making a final decision. Let’s go over them one at a time. We’ll start with pricing, since the decision will sometimes come down to only this criterion. AWeber is a premium email marketing service that offers customers a free 30-day trial. After the trial period is over, you can opt for one of five plans depending on your number of subscribers. Sending emails up to 500 subscribers will set you back $19 per month, $29 per month for up to 2,500 subscribers, and it continues to scale up from there based on the number of subscribers. When your subscriber list grows to over 25,000, you can request a quote from AWeber. All plans for over 500 subscribers include unlimited emails and come with the full suite of features right out of the box. MailChimp has been running on a freemium model since 2009 when it started offering its services for free. The free plan offers basic functionality and when you’re ready to take things to the next level, you can upgrade to any of the paid plans. The New Business plan enables online business owners to gather up to 2,000 subscribers and send them 12,000 emails per month – free of charge. This free plan doesn’t offer automation. 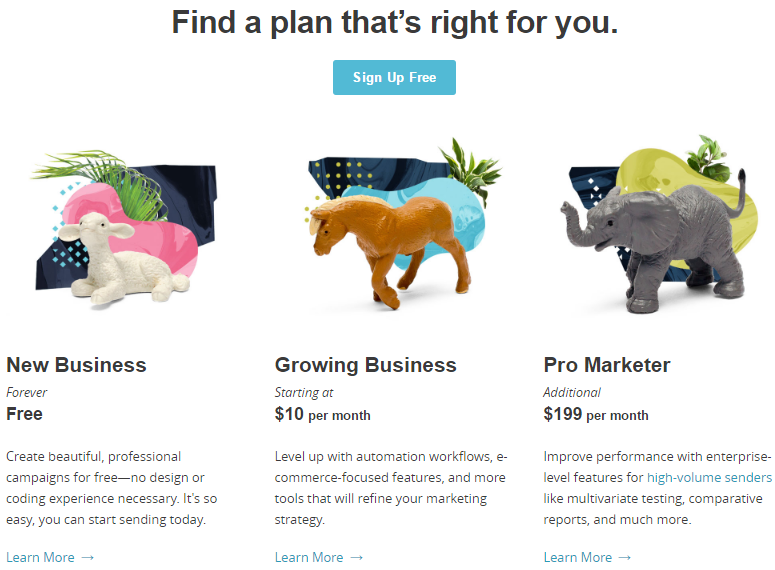 MailChimp’s Growing Business plan comes with automation workflows, e-commerce features, CRM integration services, and collaboration tools to help you up your email marketing game. Prices start from $10 per month and go up from there based on the number of subscribers. The Pro Marketer plan is designed for large-scale enterprises and ships with features tailored for high-volume senders such as multivariate testing, comparative reports, and transactional emails. This plan will set you back an additional $199 per month. Though most email marketing services have pretty much the same functionality on offer, some differentiate their brand on the usability factor. As a business owner, you shouldn’t have to invest time in learning how to use your email marketing service – it should be intuitive. Ideally. AWeber features an intuitive, clean interface that presents all of the key functionality neatly across the top. This makes it easier for users to access messages, subscribers, and reports. In addition to this, if you hover over the primary menu, you get access to a secondary drop-down menu that lets you access more focused options such as templates and statistics. MailChimp features a minimalist interface with a neat primary menu (with no drop-down menus) for users to navigate through. Compared to AWeber, MailChimp is slightly more difficult to use in that accessing its key functionality isn’t easy. With MailChimp, you’ll have to navigate through at least two pages to find the option you’re looking for since it isn’t presented on the main screen. In terms of overall functionality, AWeber offers all the tools you need to send engaging email marketing campaigns to subscribers. To start things off, AWeber comes with over 700 templates and 3,000 stock images to help you create visually appealing email newsletters and forms. AWeber takes an intuitive drag-and-drop approach for when you need to tweak the existing design or create a custom design from scratch. AWeber offers extensive split testing functionality to customers with over 500 subscribers. This allows online business owners to try out different designs and layouts to find the highest-converting one. AWeber’s autoresponder functionality is pretty simple and currently lacks when it comes to advanced workflows. One of AWeber’s strong points, however, is its 99% deliverability rate. The service maintains this rate by proactively resolving potential deliverability issues and gives users insider updates to improve their campaigns. In addition to all of this, the AWeber Stats app enables users to view subscriber stats, open and click-through rates, sent messages, and scheduled broadcasts from within its comprehensive broadcast. MailChimp offers a wide spectrum of features to its customers that range from e-commerce-focused integrations to email marketing automation. One of the best things about MailChimp is that it’s flexible enough to cater to small online businesses and Fortune 500 companies. Online business owners using MailChimp can leverage its advanced autoresponder functionality to connect with subscribers and create drip campaigns. Users can choose from a list of pre-defined templates to get started or create custom workflows that match their business’ goals. MailChimp maintains a deliverability rate of 96% to 99% through the implementation of Omnivore technology. It also receives alerts from ISPs whenever subscribers report your content as spam. Since larger businesses are constant victims of forgeries and phishing scamps, MailChimp takes care to incorporate authentication technology in its email campaigns. In addition to this, business owners can download the MailChimp Mobile app to manage their lists, send campaigns, add subscribers, and view detailed reports directly from their mobile device. The email service also offers MailChimp Subscribe and MailChimp Snap for offline use. Customer support is incredibly important to small business owners. Whether its because they encountered an issue or are having difficulty getting a feature to work, reliable and timely support is always good to have. 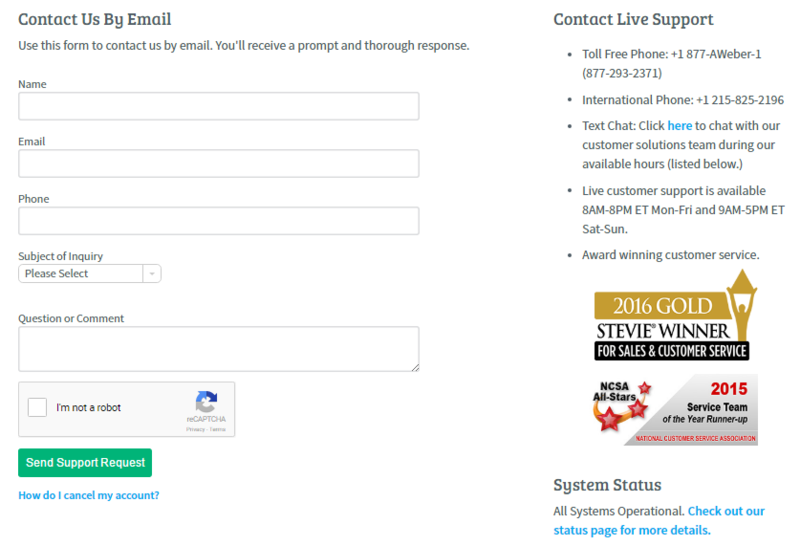 AWeber offers phone support, live chat, email support and a knowledge base, and has won a Stevie Award for their customer support. This should give you a good idea about the quality of support you can expect to get from AWeber. Online business owners who aren’t particularly technically inclined or don’t have enough resources to outsource email marketing can simply dial through to AWeber and receive timely, high-quality support. MailChimp has a dedicated Knowledge Base which allows users to search for their queries and find helpful answers on their own. In addition to this, they also offer live chat functionality and a contact form for users who prefer to get in touch with customer support staff. Up to 500 subscribers – $19 per month. Free trial for up to 2,000 subscribers. Up to 500 subscribers – $10 per month. Pro Marketer costs an additional $199 per month. Key features are easy to locate. Navigation isn’t intuitive. Key features aren’t located on the main page. Functionality Autoresponders lack in functionality. Offers mobile app for viewing statistics. Deliverability rate is 99%. Offers advanced autoresponder functionality. Comes with three mobile apps for managing email lists. Deliverability rate ranges from 96% to 99%. In some ways, AWeber offers more flexibility than MailChimp – for instance, when it comes to pre-defined templates and an intuitive user interface. On the other hand, MailChimp offers competitive prices and features powerful autoresponder functionality. However, when you have to decide between AWeber vs MailChimp, there can only be one clear winner. Which email service provider you end up going with ultimately depends on your business’ requirements. AWeber’s strength lies in its ease of use, customizability, and customer support. 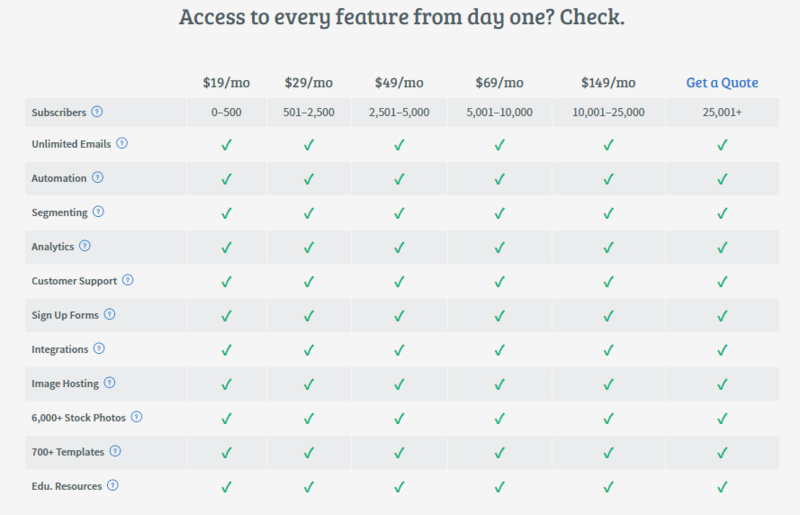 MailChimp does better in the functionality department, integration, and pricing. In the battle between AWeber vs MailChimp, it’s best to lay out your requirements and see which email service matches them most closely. That way, you can make the most out of your selected platform without having to struggle with a system that doesn’t meet your requirements. In this post, we evaluated AWeber and MailChimp against our criteria and, hopefully, you now have the information you need to make an informed decision. If you are still on the fence, check out our article on MailChimp vs Constant Contact. Which email marketing service provider are you leaning towards? Let us know by commenting below! Thanks for the comparison. I’m also considering GetResponse as they have also marketing automation. Do you know it? I’m glad we could help! Personally, I find that GetResponse’s terminology can be a bit confusing and their user interface needs some work. Other than that, it all depends on what you’re looking for in an email marketing service. If email marketing automation is your top priority then both GetResponse and MailChimp are strong contenders. GetResponse allows users to build workflows by arranging blocks following intuitive, if-then logic. On the other hand, MailChimp comes with pre-built automation workflows right out of the box.